Why Lie to Ourselves About Methane? Welcome to another packed Radio Ecoshock show. I’m your tour guide, Alex Smith. This week we look into why the U.S. government, and governments around the world, continue to kid themselves about the power of methane, the number two global warming gas in the atmosphere. With a threat this serious, coming from the melting Arctic, warming oceans, fracking, agriculture, and all or natural gas use – it isn’t “kidding”. It is lying to ourselves at great cost. A group of esteemed scientists have written to top levels of American government calling for a change toward reality on methane. Then we’ll investigate some of the costs of carbon pollution, with seasoned journalist and author Mark Shapiro. His new book is called “Carbon Shock” The show wraps up with a turn toward the spiritual, a kind of scientific change in our whole story. Andrew Beath is our guest. Or listen to/download this program right now on Soundcloud! While the world’s focus is on carbon dioxide, a group of powerful scientists have written an urgent letter to the directors of five U.S. government agencies. More than 21 scientists wrote the letter on July 29th, 2014. It’s just now surfacing in public, brought to my attention by Paul Beckwith. The scientists worry the American government, like other governments around the world, is not paying attention to the big risks posed by methane. That’s methane from the Arctic, as you’ve heard on this program, but also methane from gas fracking, which our guest Robert Howarth warned us about years ago. One of the lead agents behind this letter is Anna Moritz, known as Mickey. She’s a legal fellow at the Center for Biological Diversity. Moritz has published a lot, including as co-author of this just released paper on “The Worst Case and the Worst Example: An Agenda for Any Young Lawyer Who Wants to Save the World from Climate Chaos“. She’s also a co-author of the university level book “Climate Change: A Reader“. This letter is one of those rare historic and extraordinary warnings from scientists to top levels of government. It reminds me of the letter written by Albert Einstein to President Roosevelt, warning atomic power is real, and could be used to make a super-bomb never seen before on Earth. Now we have the methane bomb. Read the letter for yourself here. I am not a scientist. I’ve learned from my guests and research. I welcome any corrections to this primer. Here is the situation in a nutshell: carbon dioxide is measured as a global warming by it’s climate forcing over a 100 year period. That is given the value of 1. There are other greenhouse gases that are many time more powerful than carbon dioxide, so they get a higher number which is meant to compare them to CO2. Methane (CH4, also known as “natural gas”) deteriorates in the atmosphere, devolving into more carbon dioxide, among other things. The life of methane at it’s most powerful levels is around 12 years. In order to compare methane to carbon dioxide, it was given a comparative number of 20. If we look at the warming potential of methane over 100 years, pound for pound, or kilo by kilo, it would be 20 times more powerful at trapping warmth than CO2. Here’s the trouble: during it’s (approximate) 12 year life in the atmosphere, methane is actually at least 86 times as powerful as the same amount of CO2, according to the most recent science, and it’s very good and dependable science. Other scientists suggest that for very short periods, perhaps a year, methane could be 150 times more powerful than CO2, or even higher. The United Nations Intergovernmental Panel on Climate Change has moved a bit, raising methane’s Global Warming Potential (GWP) from 20 to 34 – but that’s still based on 100 years, and is still misleading and dangerously low. Previously, say in the 1990’s, governments took the long-term view of global warming. It was something that would develop over centuries, and wouldn’t likely be seen much until later in this century. They talked about limits for greenhouse gases for the year 2100. Then big impacts of climate change showed up at the START of this century. Arctic sea ice melted away to levels not seen in human history. Glaciers began to disappear. The weather went strange, heat records climbed, ocean acidity rose, and the weather went wonky. It turns out the Earth’s sensitivity to greenhouse gases was far great than science previously thought. So now it matters very much what happens in the short term, including in the 12 years methane is in the atmosphere. Worse: that 12 year term assumes methane appears, and then disappears. But what if we have a steady source of methane, something that keeps on replenishing the load in the atmosphere, or even increases it annually, and decade by decade? Paradoxically, the Environmental Protection Agency has a chart on their site saying methane emissions from the United States have actually gone down a little in the 12 years from 1990 to 2012. They don’t post more recent information, which would include fracking. Radio Ecoshock guest Scot Miller from Harvard was part of a group of scientists that found real methane emissions in the atmosphere are at least 50% greater than EPA calculations. The EPA used a ground-up figure, trying to add up things like gas wells, wetlands, and cows. Meanwhile other scientists flew in the air and measured what was up there. It’s almost like the Agency doesn’t want to know, or is stuck in the past. Can this letter give them a push in the right direction? Added to those human sources of methane, we have two new giants on the block. 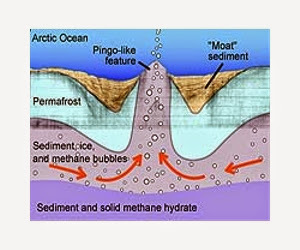 The first is frozen methane in the ocean, blobs of methane and ice called clathrates. These are found in both the Pacific and the Atlantic. The Japanese talked about mining them for energy. But the biggest threat appears to be clathrates located on shallow sea beds in the rapidly warming Arctic. There’s a lot of hurried, almost desperate, research going into that now, with a focus on the shelf off the coast of Eastern Siberia. Scientists have already found funnels of methane bubbling to the surface, more than a kilometer across. Here is an interesting article about that “Arctic Seaved Methane Stores Destablizing and Venting” from TerraDaily.com. permafrost, the permanently frozen cap covering the northern part of this planet. At least we thought it was permanent. Now with Arctic temperatures soaring 10 or even 20 degrees Fahrenheit above the previous normal, the permafrost is starting to melt. Check out this NASA factsheet on permafrost methane: “Is a Sleeping Climate Giant Stirring in the Arctic?” NASA is trying to monitor Arctic methane with a project called “Carve“. As I understand it, melting permafrost opens two great methane risks. The first is release of methane trapped in pockets below. This is thought to be the cause of at least two explosions and craters found recently in Siberia. The second is more insidious. As the surface levels melt, there are plant materials that have been kept frozen for many thousands of years. These are already starting to melt, and then rot. Plant materials on the ground will release CO2. Those under the millions of shallow ponds in the Arctic will decay without oxygen, and release methane, clouds of methane. For all these reasons, it is a dangerous fallacy to only count methane as “20”, as though it comes up once in 100 years and then disappears. That is why a group of illustrious scientists have written the American government, asking for the higher scientific standard of 86 to be used, instead of the old number of 20. If we use the new standard, the real risks of methane become apparent, and that adds heat to the government’s responsibility and effort to limit methane emissions in every way we can. It certainly means new regulations to force gas drilling companies to stop venting methane, at drill and storage sites, and to repair leaking equipment and pipelines. It certainly means going further to capture methane from land-fill sites, and push an international effort to change agriculture to minimize methane emissions. I ask Mickey Moritz why the standard hasn’t changed already. After all, as she tells us, other standards for gases have been changed as new information comes along. We can guess the natural gas industry, with all its political donations, is against the change. But Mickey also says there is a problem with international reporting. Countries calculate their emissions using the old standard of 20. If America leads the way to the new methane standard, U.S. emissions will suddenly appear to go up. The scientists suggest America could use a double accounting standard for now: a value of 86 for domestic regulation, and a value of 20 for international reporting, until that can be changed by international agreement. That can easily be done, Moritz says. For me, and I’m sure for the scientists involved, this urgent letter is more than about book-keeping. To get the kinds of action that have any hope of saving a habitable climate, we need to stop lying to ourselves about the power of methane. It’s the second largest source of warming on the planet. Paul Beckwith tells me the “Present radiative forcing of methane is 1 W/m2 [Watts per square meter] compared to 1.7 W/m2 for CO2”. Be sure and listen to this interview with Anna “Mickey” Moritz, available in CD Quality, or Lo-Fi. The letter was addressed to letter to John Holdren, Gina McCarthy, the Administrator of the Environmental Protection Agency, and Ernest Moniz, the Secretary of the Department of Energy, among others. That was a month and a half ago. So far there has been no reply, but Mickey thinks the wheels are turning. When America leads on methane, we need to see the world community act in the 2015 Climate Summit in Paris. At the very least, we can stop lying to ourselves about methane. There are two kinds of climate denial running around: theirs and ours. Some people and politicians still say climate change isn’t happening, even as extreme weather events pummel the globe. Others know global warming is coming on much too hard and too fast. That can become to a despair so deep we don’t want to talk about the phoney solutions coming from business, national governments, and those failed international talks. Despite all the green hype, carbon emissions are rising, and the increase is increasing. Face the facts: this is a human problem requiring human solutions. If you don’t like the idea of new taxes on carbon, our next guest says we are already paying plenty for climate damage. * why some “Conservatives” want to fight climate change with carbon taxes and clean energy (no, the climate movement is not just something that happens in New York or San Francisco). Mark Schapiro is now out on a large-scale book tour to promote “Carbon Shock”. He’ll be blogging all over the place. 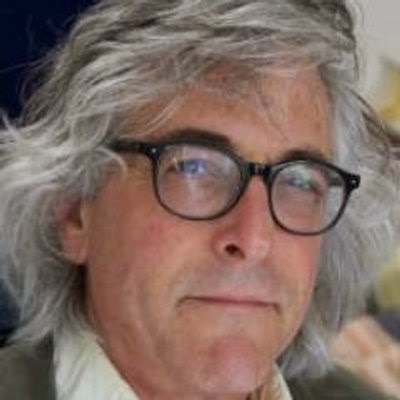 Keep track of Mark and his work via his Twitter feed: @schapiro. You can download or listen to this Radio Ecoshock interview with Mark Schapiro in CD Quality or Lo-Fi. Along with the book I received a fact sheet which says “Just ninety companies are responsible for two-thirds of greenhouse gase emissions”. We all need to know who those biggest polluters are. It shows once again that real climate talks can’t just be in New York, Lima or Paris. They need to happen in the Board Rooms of multinational corporations. “Carbon Shock, A Tale of Risk and Calculus on the Front Lines of the Disrupted Global Economy” is just out from Chelsea Green books. Find it here. When I consider the climate movement, it seems almost split into two camps. One is very science-oriented, fending off any suggestion of spirituality. The other is spiritual, where science is almost a side-line. While most of Radio Ecoshock is devoted to science, we all know there are deep movements within us that science can’t really touch or fulfil. I used to think if you gathered all the science-oriented people in one room, and all those concentrating on the spiritual approach in another, you would have more men in Room A, and more women in Room B. Is that sexist, or does there tend to be that difference between genders? But then, all those preachers, mullahs… old-time religion was not just created by men, to worship a man-God. It continues to promote sexism, including denying women leadership roles in the church. So it’s little wonder some women are looking for spiritual alternatives. While science has been dominated by men for a generation, there is a whole crop of really smart women scientists coming up now. It’s a breath of fresh air for sure. Meanwhile more men are realizing just staying nailed to jobs and football, while avoiding our inner needs is harmful, if not fatal. Our next guest has been a green activist for 30 years. He founded the environment group Earthways Foundation in California back in 1985. More recently, Andrew Beath has been considering our green needs for spirituality. For example, he’s the author of the book “Consciousness in Action, The Power of Beauty, Love and Courage in A Violent Time.” The Earthways Foundation is still going, with some helpful projects in Los Angeles, but also in Latin America. Beath was also instrumental in founding “Social and Environmental Entrepreneurs” which guides people into setting up non-profits for social change. Beath has helped save Wetlands in L.A., and assisted in starting up Amazon Watch. He’s got a long trail of organizations he helped birth. Now Andrew is publishing a trilogy of books which look at a new story of creation, one based on the amazing discoveries of science, but also new ways of looking at the world. The Trilogy is called “The New Creation Story, Spirit, Eros, and Climate Chaos”. Find out more here at the book web site. Books One and Two are already on sale. Book Three will be released shortly. The new creation story goes right from The Big Bang to modern times, with illustrations of life in between. Previous religions have begun with an act of God, followed by just a few thousand years of history. Then the bones of dinosaurs and the study of geology showed that timeline was flawed. Now we have amazing views into the galaxies, and with it, into deep time. We need new narrative about the beginnings of things, to know where we are. We also discuss whether life on this planet has a consciousness, something we could call “Gaia”. We don’t really know how human consciousness connects us, or why sudden waves of thought pop up all over the world. The psychiatrist Carl Jung called it “synchronicity“. There are lots of people out there who hope, maybe even pray, that a wave of awareness could spread rapidly across the globe, driving us toward action not just on climate change, but in our whole relationship to nature. I ask Andrew if that is his hope, and are there any signs of it? Ever the realist, Beath says right now it looks more like we are going the wrong way. “Business as usual” is still in triumph. But, in the end, Andrew Beath has not given up. He knows and feels the depths of our damage to the Earth. But Beath tells us: “the destruction we’ve caused is the catalyst for the next step in human consciousnesss”. Once again, we are totally out of time. Thanks for sticking with the program. It’s been a while since I updated our stations list, or counted them up. Good news! Radio Ecoshock is now broadcast on 87 non-profit radio stations in the United States, Canada, the United Kingdom (we can still say that), Australia, and now Paris, France. You make it all happen, by passing on the Tweets, Facebook links, emails and word of mouth. Let’s get the word out there. My thanks to those who donated this past week, to keep Radio Ecoshock going. You covered the electric and internet bills for this month. I’m Alex Smith, and let’s get together again next week. Tags: arctic carbon climate climate change ecology ecoshock environment fracking global warming methane radio science U.S.
Hello Alex; I recall your interview with KMO a couple weeks ago. I am sure he said, during your dismantling of Dr. Guy Mcpherson's human extinction predictions, that the methane levels were a "drop in the bucket". I don't think we will go extinct, but I do believe we will lose the vast majority of humans on the planet. I also believe methane will play a major role in this coming disaster. Strange that people get so hung up on this going extinct or not going extinct. Really, what they should be concerned about is how to hold on to what little sanity they'll have left once they experience death (of loved ones and near close ones) one after the other after the other after the other. Again I speak as a survivor of the AIDS plague of the 80's and that's after being a caretaker for my parents in my twenties. Lung Cancer spread to the bones for my mom followed by a years reprieve before my dad suffered through a couple of years with pancreatic cancer. You ain't seen nothing yet until you watch all your peers begin to age, wither and die right before your eyes. Your own mortality right there before you. It's happening now (or starting to with Ebola). It's "funny" to me because last time I went through this so many hetrosexuals acted so smug and pretentious that it wasn't gonna touch them. Right now at the start whites are looking at blacks the same way, only Ebola knows no bounds. On the topic of methane. Gavin Schmidt proved what a perverse individual he is by his behavior towards Natalia at the Royal Society. Schmidt's behavior is not what I could call good science or respectful in general. So many cover their ears to what they don't want to hear. Including one Robert Scribbler, Michael Tobias and of course Scott Johnson to name a few. Just finished reading "Collapse of Western Society" and "Cracked: The Unhappy Truth About Psychiatry." The first is a rather denalist fantasy about the future, yet in the back of the book are interviews with both authors which gives a clear reason as to what their state of mind is. It answers the question as why they are so adamant about their views (and probably why some many others are stuck in this place). They can't allow themselves to believe that they will have to face the situation. It's easier and safer for them to push it so far away that it will effect their offspring (how loving) and not them. That's nothing more than putting blinders on. Reading the second book is a truly mind blowing experience especially for one who was heading towards a PhD in Psychology after spending over 20 years in Finance/Wall St/Banking as a Systems Analyst. There were so many signals that things were not quite right with what i was being "taugh." I raised so many questions that most of my professors found me troublesome and a bother. I was supposed to just accept the fact that talk therapy worked and that the DSM could do no wrong. Davies, the book's author unwraps the whole sorted affair of what's really driving the therapy field. Collusion and money between all parties, professionals, pharmaceuticals, and journals. How the DSM came about and why with each succeeding edition the problems were only compounded and never solved. Imagine now they are finding that having normal emotional reaction like sadness when responding to lose is being medicalized. This entire system is out of control. Then move on the "The Therapy Industry" to see why the whole concept of the talking cure has need worked. There is no scientific evidence to support this, and when you realize that therapy is pointing the finger at the wrong end of the problem by pretending it's all the patient's fault and not the flaws in the world we live within. Read these two books and think about having the authors on the show. These areas really add much needed depth to the Climate discussion and why we won't be getting any help from the "Mental Health" field.